Engagement / GB book / Media Economics / US Press — Comments Off on The New York Times and innovation: are they asking the right question? The New York Times and innovation: are they asking the right question? The New York Times did a kind favour to the rest of the news media when, amidst the storm provoked by the sacking of its editor Jill Abramson, we got to see a report on the paper’s lack of progress in digital journalism by a group of its younger editors. I don’t need to describe “Innovation” further for you: it’s been capably done elsewhere (see also here). Instead, I want to ask the question which I haven’t yet seen put, perhaps because it makes people a little nauseous. Is it actually possible for a big, mainstream newspaper to make the transition to being, principally, a digital platform for journalism? Not just make the transition slowly, painfully and with embarrassing mistakes but…not make it at all. I’m by nature an optimist and I recently I wrote a book which, among other themes, looks at the regularity with which journalism re-invents itself when disrupted. But having read the 96 pages of the NYT document, even my faith in the future was dented. As many other readers have said, it is a brutally frank self-examination. But for all the bravery involved, a number of questions just aren’t there. With all the fervour of tribesmen waving a talisman to ward off evil spirits, the authors repeatedly praise the outstanding quality of the NYT’s journalism. A touch smug, an outsider might think, but hardly controversial. People who ponder journalism’s prospects have turned cheerful. Not suddenly, but over the past few months. The evidence that there’s capital, generative energy and signs that some digital publishing can survive is too obvious to ignore. So the shift has been from pessimism to futurology. What kind of journalism are we going to see or should we want to see? “Open”, “networked”, radical, non-capitalist or done in looser structures than in the past? Because we’re in a phase of accelerating, plural experiment, what will happen will be all of these things and more. Just pause for a second to appreciate what a change in the conversation the hi-tech millionaires, philanthropists and venture capitalists have brought about, at least in the US, by demonstrating that they want to be involved in building the next journalism. The emphasis is now more about the content than about the delivery and the platforms. As a writer of the pre-digital age put it, we’re watching “the turning of a stream of fresh and free thought upon our stock notions and habits.” This is nowadays known as “disruption”. Here’s a meandering list of seven factors which will shape the next journalism. I’ll be talking about this at the International Journalism Festival in Perugia later this week. (And there’s more on the background to all this in Out of Print, see right). I wrote here recently about how “pure-play” online news and comment sites were starting to find their feet in greater numbers commercially, and, as they do so, more confidently rewriting the handbook on how journalism gets done most effectively with the tools newly available. Nothing unusual about this: upstarts, dismissed at first as frivolous, grab large audiences and then work more serious stuff into the mix. It’s happened throughout the history of journalism so far – with the exception of the late 20th century when advertising income was secure. And it’s happening again now. (For a longer version of this argument, see Out of Print, details on the right). But there’s one aspect of this that gets sidelined in a lot of discussion of new things. And that’s because the importance of editors is an old thing, being rediscovered yet again. As the digital era began and its opportunities and possibilities emerged, one thing became clear. News media were going to “de-industrialise”. The dominant position held by a small number of print publishers and terrestrial broadcasters was not going to disappear but it was going to be eroded because the power to publish was being radically redistributed. Furthermore, this argument ran, individual journalists would be empowered to become independent of corporate monoliths. Journalism would not just de-industrialise but the newsrooms would no longer be the dominant unit of organisation. The important player would be the smallest atomic particle in the system: the individual journalist. My apologies for the break in transmission from this blog, My day job took over completely during the autumn of 2013 and I will try to do better in 2014. As one year flips over to another, bloggers and others get asked to do pieces summarising the highlights of the year about to end in a style which used to be known in print newsrooms as “pipe-suckers” or “cud-chewers” (my own ruminations here and here). This time round, there was one common denominator to the looks backward and forward. To summarise the summaries, optimism about journalism reappeared. No one believes that anyone has cracked the problem of a digital business model for news publishing. But there’s a gently rising tide of new things working and the unexpected being tried, sometimes with success. Some time in 2013, without anyone quite marking it, a corner was turned. 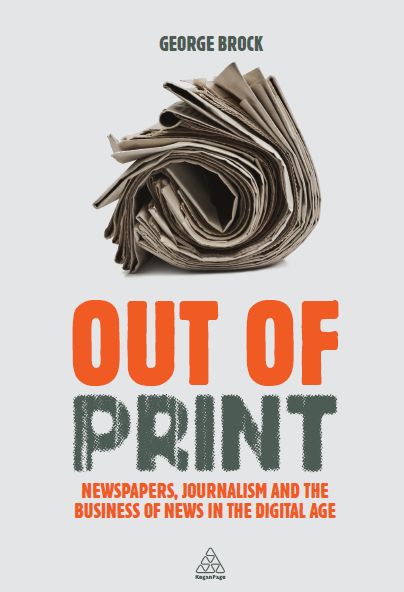 I spent the first part of 2013 writing a book (see to the right of this post) which argues that gloom and pessimism about journalism fly in the face of (a) what’s happening outside mainstream newsrooms and (b) history. Like most authors, I thought I was arguing against the prevailing pessimism. I emerged from my study and the seclusion needed to get a book finished to discover that I was pushing at a door not exactly open, but easier to open than I’d thought. The climate of opinion was changing. Jeff Bezos is showing early promise as the new owner of the Washington Post: he has a sound grasp of how to say something familiar in an arrestingly new way. On one level, this is plainly true. As a medium for news, ink marks on squashed trees are economically inefficient, environmentally damaging and slow. Print, even for news, will not be replaced by digital. New media almost never completely substitute for older media; the newcomers shrink and shove to one side their predecessors. Just as the combustion engine became the standard way for people to get around without making horses disappear. This post opens with a hat-tip to Martin Moore, who pointed out to me the other day what a remarkable document is the message recently sent to the staff of the viral video site Buzzfeed by its founder Jonah Peretti. I’d seen mention of it, but failed to see its importance. It is fascinating and well worth a read. Peretti’s start-of-term pep talk is both new – digitally aware, thinking ahead and celebrating innovation both editorial and technical – and at the same time old. Improbable, even shocking, innovation to grab an audience and income which can later fund journalism has happened before. In fact it’s happened throughout most of journalism’s history with the exception of the late 20th century. What Peretti’s memo describes is the compressed history of a site begun to make it easy for bored people at work to swop silly videos and lists is now hiring foreign correspondents and investigative reporters, often the two most important and expensive tribes of journalists found in any newsroom. Peretti did not reach this position by waking up one morning and deciding to help democracy be better informed; he put together a team of alpha geeks who built a site which was unbeatable for sharing video of skateboarding cats on smartphones and social media. With that foundation, he can now go out and compete for high-prestige journalism prizes. Many experiments fail; Buzzfeed might. It uses its not inconsiderable creative skill to make fluent, clever semi-disguised ads for companies which pay for the service. Critics allege that this will blunt the site’s reportorial edge; we’ll see. (In my book Out of Print just published, I record a senior Buzzfeed person who seems to admit this: page 221). The giggling frivolity might simply overwhelm trying to explain what’s happening in Nairobi or Nablus.